In the blink of an eye, 2018 has passed and we are now settling into 2019. This January, instead of a monthly roundup, we are going to share what San Jose Public Library bloggers picked as their favorite stories that they read in all of 2018, which could be new or older books. These include mysteries, biographies, graphic novels, and more. So lets get down to it: here are the best of the 2018 best! Be sure to let us know your favorite reads of 2018 in the comments below. Her intended, Gifford is a horse. Every day when the sunrises he becomes a noble chestnut steed—but the sun goes down he's back to being human, with a mouthful of hay. It’s all very undignified. The plot thickens as Edward, Jane, and Gifford are drawn into a dangerous conspiracy. With the fate of the kingdom at stake, our heroes will have to engage in some conspiring of their own. But can they pull off their plan before it’s off with their heads? I absolutely adored this history re-imagined story of the real life Lady Jane Grey. To be honest I have no idea who that is, but whatever you learned in history class I'm sure this version of events is much, MUCH better! After King Edward arranges a marriage between his cousin Jane and a man named Gifford. Jane finds herself married to a HORSE! I don't want to go into a lot of detail, but just watching these two characters try to navigate their new marriage alignment... with the added stress of one of them being a horse, has made for a very hilarious plot line. Also the narrator interjects randomly throughout the story and it makes very a hilarious and thoroughly entertaining read. I would also recommend the audiobook version of this YA read. - Penelope G.
I read many good books this past year. The book I chose, however, as the best book I read in 2018 is one that impacted me both intellectually and emotionally. The non-fiction biography, Barracoon: The Story of the Last Black Cargo, by Zora Neale Hurston tells the story of 86-year old Cudjo Lewis who was captured in Africa and brought to the United States on a slave ship via the Middle Passage. Through a series of visits to Lewis at his home in Alabama, Hurston interviewed him and documented his memories of Africa and his time in the United States both as a slave and after slavery was outlawed. Hurston conducted the interviews with Lewis in 1927 and wrote the dialogue as spoken by Lewis with his unique language style and dialect. Due to the difficulty of finding a publisher at the time that was willing to leave Lewis' dialect as written or that did not shy away from the subject matter, the book wasn't published until 2018. I'm grateful Cudjo Lewis' life story was eventually shared with the world - it certainly is one I will remember. 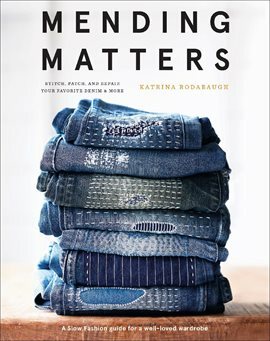 - Dana L.
My pick for 2018 is Mending Matters by Katrina Rodabaugh. Mending Matters is a sewing guide, but it is also a book about slow fashion, mending, and mindfulness in how we wear, re-use, and dispose of our clothing. It offers a how-to guide to mending, but also looks at the bigger picture of how we care for our possessions and ourselves. - Stacy T.
I wanted to optimize my chances of getting pregnant in as short amount of time as possible. Having spent the better part of my adult life focused on NOT getting pregnant, I didn't know much about how to make the opposite happen. This was one of the first books I picked up on the topic and was a good start for me to understand more about the tools, healthy habits, and timing practices that can help to increase the odds. My one criticism is its frequent assumption that every woman is married to a man when she proactively decides that she wants to get pregnant. However, if you can get past the heteronormative language, it's a quick read with an easy conversational style that still includes research studies and stats. I ended up getting pregnant pretty quickly last year. The first one didn't stick for very long, so I ended up referring back to this book since it had a useful section on miscarriages. I'm expecting this spring, but I don't think I would have accomplished that goal so soon if I hadn't used this book as a jumping off point. - Julie O. The story features a coming of age story of a young girl, who is abandoned by her family, growing up in the coastal wetlands in North Carolina; the protagonist, who prefers to interact with wildlife in the vast marshland rather than humankind, garners a few romantic entanglements along her shaky path into adulthood, which eventually shapes her, for better or worse. The story is intriguing because it is set against the backdrop of the coastal marshlands of North Carolina, and not only is it beautifully written in lyrical prose that accurately captures the essence of the coastal marshlands of North Carolina, it’s also an on-the-edge-of-your-seat page turner, which will leave you guessing until the very end. It was written by the incredible William Goldman as a gift to his two daughters; one had asked for a story about princesses and one had asked for a story about brides. It can be categorized as adventure, romance, comedy, fantasy or fairy tale. But, at its core, it is a satire of each one. William Goldman, twice-over-academy-award-winner and esteemed author, said that he gets more fan mail about The Princess Bride than any other book or movie he has written (a lot of people like the story). Also, he died this year, so this is it folks. Ten years ago, a scientist discovered the gene that links you to your “one and only” soul mate. The One follows 5 people who have recently been matched. Mandy, a divorcee, is cyber-stalking her soul mate, Richard, before she is brave enough to actually meet him in person. Christopher, a serial killer, is very intrigued that he has been matched to Amy, a police officer. Jade, a college graduate drowning in debt is matched with Kevin, a farmer living in Australia. Nick is happily engaged to Sally, but Sally wants confirmation that they are each other’s soul mate before they get married. Ellie, the CEO of Match Your DNA, is matched with mild mannered Timothy, a systems analyst. If you think that these couples will have a happily ever after, think again. For each character, something goes horribly wrong with their match. Brazen combines three of my favorite things: beautifully illustrated graphic novels, interesting history, and fierce women who changed the world! Learn about the beloved bartending bearded lady, the revered African queen who thwarted numerous assignation attempts, the imaginative actress who created the modern witch, and over a dozen women who didn't take "no" for an answer. Each chapter of this graphic novel tells the story of unique, and mostly unknown, inspirational women and their captivating stories. The illustrations are gorgeous, with vibrant colors and striking modern character design. This is a great read for history buffs, graphic novel readers, fans of Kate Beaton/Hark! A Vagrant, and anyone who wants to learn about women not covered in history class. Celebrate 2018, which was dubbed "Year of the Women," with this fantastic novel. - Jessica N.
Bad Blood: Secrets and Lies in a Silicon Valley Startup, journalist John Carreyrou, chronicles the rise and fall of medical start-up Theranos. Carreyrou takes you inside Theranos and profiles Elizabeth Holmes, the leader once thought to be the next Steve Jobs. It is a fascinating look into how people can buy into the hype of an impossible product if the leader is charismatic enough and a cautionary tale for those living in the heart of Silicon Valley. As an aside, it is fun to read about places I'm familiar with as locations and businesses around the Bay Area get mentioned throughout the book. - Leizel C.
My reaction: Based on personal experience, the emotional toll that taking a genetic test has on you is accurately reflected in this book. Adina and Tovah both are overcome with guilt, anger, denial and helplessness. They both retreat to their own respective worlds and reflect and heal in their own ways. I highly recommend this book for anyone who has undergone genetic testing or who has a genetic disease. - Alyssa M.
This hilarious read recounts the battle of addiction...to film. Comedian Patton Oswalt is out to share his story of his own obsession with films. The book is available through the Libby App and is rich with humor. You may also feel enticed to check out a movie soon after reading it. The library has just the fix for that thought. - David F.
Submitted by Megan Hicks on Thursday, January 17, 2019 - 4:00 PM.